Allen Crowder has 10 more professional fights than Greg Hardy. He’s been doing this since 2014, while Hardy made his pro debut seven months ago. But, with betting odds for Crowder currently sit at +375, according to Bovada, he will be among the biggest underdogs on the UFC Brooklyn card at Barclays Center on Saturday night. Hardy is the big favorite after three pro fights lasting less less than two minutes total in the cage. 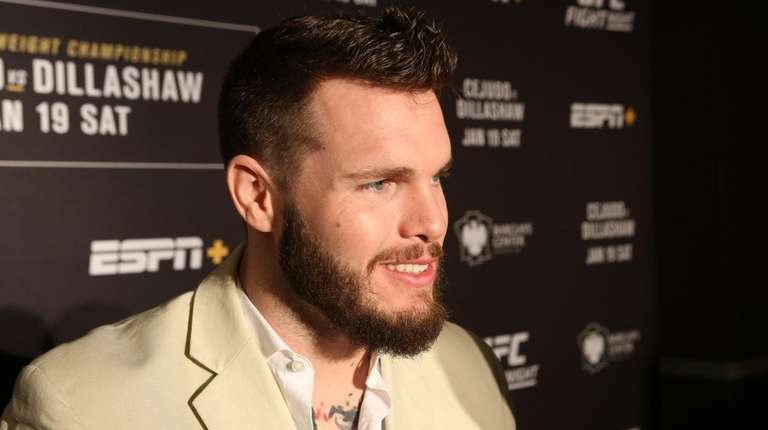 Crowder said having little footage of Hardy to analyze isn’t an issue since he typically doesn’t study much film before fights, but he says Hardy has one big weapon to watch for. Life is better at lightweight for Dennis Bermudez. The Long Island MMA-based fighter is in good spirits ahead of his first bout at 155 pounds, one weight class above the featherweight division he’s fought in since joining the UFC. “The battle with the scale has been different, I’m not waking up and standing on the scale thinking, ‘man I wish I was one pound lighter.’” Bermudez said. “My numbers throughout this weight cut are only four or five pounds higher than they usually would be during fight week. Bermudez wondered whether he should have made the jump in weight sooner. Despite living close by, Bermudez is spending fight week at the UFC’s hotel in Manhattan. Alexander Hernandez says he respects what his opponent Donald Cerrone has accomplished in the cage, but he believes it’s time for new blood like himself to have their turn. Hernandez (10-1) had fans calling him the next lightweight champion at the workout, but with just two UFC fights under his belt, that seems a way away. Still, he already is willing to talk about current lightweight champion Khabib Nurmagomedov among others.